Many of those who didn't cast ballots for Donald Trump have spent much of the last week struggling to come to terms with America's post-election reality. News that our new president-elect is stacking his cabinet with men like Steve Bannon and Sen. Jeff Sessions has heightened concerns about what Trump's presidency will mean for minorities and women. While acknowledging the rough road ahead, noted feminist and author Gloria Steinem has been using a powerful metaphor to encourage a bit of post-election hope. In the days following the election, Steinem has not shied away from claiming that Trump is not her president. "I'm not going to disobey the law, but I'm not going to pretend he represents me," Steinem told John Hockenberry, host of The Takeaway. Clearly, sitting on the sidelines for the next for years is not an option. But what should other women who feel similarly about a President Trump do? How do we advance issues central to the lives of women when the man moving into the White House doesn't appear to support those issues? 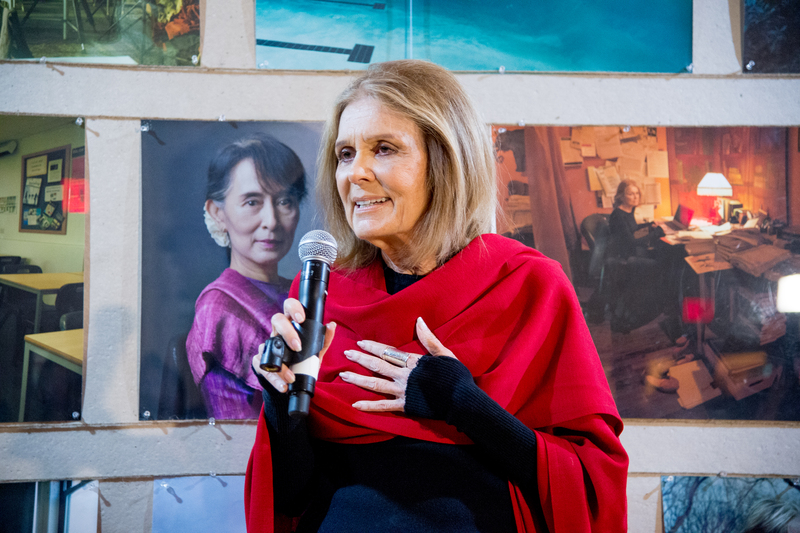 It was a question Steinem tackled earlier this week during a "talking circle" she hosted ahead of the New York debut of Annie Leibovitz's traveling exhibition, "Women: New Portraits." In reflecting on the election's result and considering where concerned voters should direct their attention going forward, Steinem encouraged empathy and understanding over demonizing Trump supporters and reminded participants that the resources available to them Nov. 7 were still available to them. "We have all the powers we had [before] of lobbying and pressuring and making clear that the political consequences are great," said Steinem, according to the Daily Beast. "We may look up and feel powerless and think there's nothing we can do, but it's not true. There are things we can do at each level." Steinem went on to compare the United States to a survivor of domestic violence, arguing that the worst and most dangerous moment comes not early in the relationship but just before the victim is able to shake off their oppressor and break free. "When a woman is about to escape a violent household is the time when she is most likely to be beaten or murdered," she said. "She's about to get outside of control. I think we are at a time of maximum danger in this country and we need to look out for each other." Moreover, Steinem has argued that, just as President Barack Obama's election did not represent an end to the need to strive for equality, Trump's victory is not an end but a new beginning to the struggle. She emphasized the benefit to having the truth, as ugly as it may be, finally out in the open. And indeed, there's a sound bit of logic there. Knowing where things stand gives us greater insight into how far we still need to go. "I think that what has been revealed to us is a truth that we must now deal with," Steinem said ahead of the opening of Leibovitz's exhibit. "Never again is anyone going to say ‘post-feminist’ or ‘post-racist’ because we [now] understand that there is something like a third of the country that is still locked into these old hierarchies." While it may seem especially bleak to compare post-election America to a survivor of domestic violence, Steinem used the analogy to inspire hope about what has yet to come. "Just as we wouldn’t send a woman or child back to a violent household, we’re not going to go back," she said. "And maybe we're about to be free."